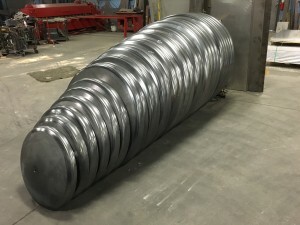 Carbon Steel Tank heads any size or quantity - Wisconsin Stainless Heads Mfg. Inc.
Wisconsin Stainless Heads Mfg. Inc.
We often get asked, “Can I order just 1 or 2.” Of coarse! This is a perfect example of our ability to meet customer needs. We recently completed a carbon steel tank heads job for a paint mixing plant. This job required 1 or 2 heads of every size in 2″ increments starting at 24″ and going up to 54″. This job required 15 different sizes and the largest quantity was 4 of any one size. In summary, no job is too small!